Ears lean back, teeth are bared and eyes look scary on this Timber Wolf at Omega Park in Montebello in Quebec, Canada. Something seems to have set this Timber Wolf into a bit of a state as he bares his teeth for us at Omega Park in Montebello, Quebec. 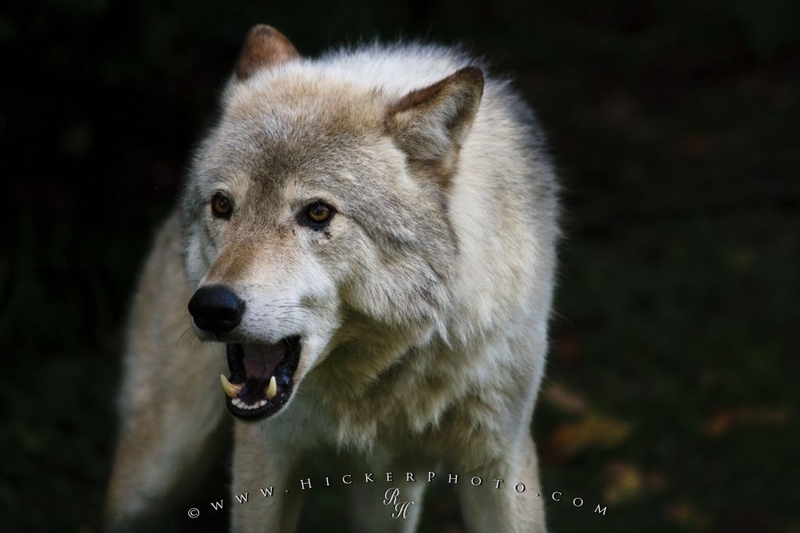 This animal is a beautiful creature and being able to snap a picture of a Timber Wolf at this close range with a unhappy look on his face is something you may never capture in the wild. The coloring of the fur of the Timber Wolf changes with seasons as it provides excellent camouflage for the wolf in the winter months. His sharp teeth are what makes this animal a force to be reckoned with and you can see why other animal species fear the Timber Wolf. at Omega Park in Montebello, Quebec. Most people that come to Omega Park in Montebello, Quebec spend a fair amount of time watching the Timber Wolves and their unique way that they sleek around their habitat. They have become one of the most favorite types of animal to watch while at Omega Park with their beautiful fur encompassing their face. The size of them is astounding as they can grow to be about five feet in length and two and a half feet tall as they are the largest species of canines in the world. I photographed this photo with the digital SLR camera model Canon EOS-1Ds Mark II, aperture of f/6.3, exposure time of 1/320 sec. on ISO 400, as always I used a original Canon Lens, the focus lenght for this picture was 370mm.